Crude prices are $47.57 this morning, up $.16 (.34%) from yesterday’s close. Prices lost 93 cents yesterday, but have recouped some of the yesterday’s 2% losses this morning. Crude prices have remained mostly stable this week, with only $1.72 between the high and low of the week. Refined products are continuing to strengthen this morning with RBOB (Gasoline) leading the way. Hurricane Harvey is quickly approaching the Gulf Coast leading many refiners to take precautionary measures by taking production offline. The refineries being shut down is creating a bullish market for refined products. Gasoline opened this morning at $1.6871, nearly 6.5 cents higher than yesterday’s opening. Prices are currently at $1.7111, gaining over 4 cents since yesterday’s close. Diesel has recovered from yesterday’s losses and is currently at $1.6393 gaining just under 2 cents (1.13 %) since closing. Although Diesel has not rallied as strong as gasoline, prices are at their highest in two weeks. All eyes are fixed on the Gulf this morning as a major location for U.S. refining is preparing to go offline for the weekend. Tropical Storm Harvey was upgraded to Hurricane Harvey and is expected to hit Texas this evening. Houston is already beginning to rainfall as the storm moves inland. OPIS noted this morning that Houston is the most populated city in Texas and the fourth most populated city in the U.S. Harvey is being forecast to reach Category 3 intensity. 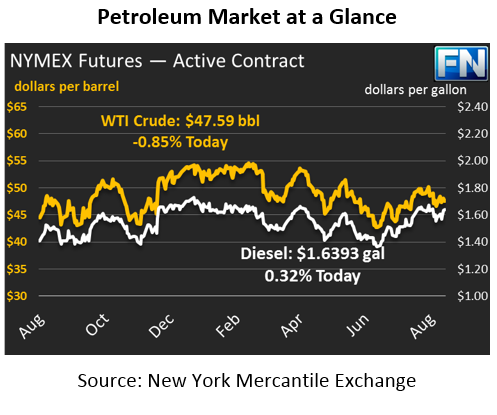 It’s been a mixed week for oil prices with crude remaining fairly flat throughout the week, while gasoline and diesel have seen more volatility. Diesel opened the week on Monday at 1.6211 and saw a spread of over 5 cents with drops as low as $1.5670 mid-week. However, diesel has managed to recover from its losses and end the week stronger than it began. Gasoline’s weekly opening price was $1.6274, 8 cents below current prices. Market expectations for U.S. inventory levels were fairly accurate this week to levels that the EIA reported, which is a rare occurrence. This week both crude and gasoline inventories drew, while diesel remained unchanged. News has been light this week outside of Hurricane Harvey expectations and updates.